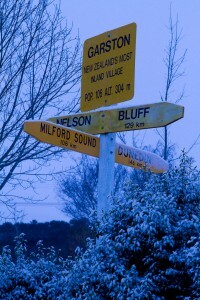 In Garston, the crossroads between Milford Sound and Bluff, where the ferry is caught for Stewart Island. If you’ve been following along form the beginning, you’ll already know that, while in the North Island, heavy rain prevented us from doing river rafting and created heavy snow that shut down the Tongariro Crossing as well. After a week’s worth of amazing weather, I suppose it was only a matter of time until we got caught in a storm. It is wintertime, after all, and one of the gambles you take when traveling during the off-season is dealing with bad weather. We had a 6am pick-up this morning so that we could hit the road and get out to Milford Sound in time to do one of the tours provided by Real Journeys. I had pre-booked a nature cruise by them and was looking forward to the trip. Of course, waking up to massive amounts of snow on the streets turned out to be a bad omen. Our bus full with passengers new and old, our new driver Chase made it clear that she would do what she could but that safety was of prime importance and that it didn’t look good for getting to Milford. She did try her best, but the road conditions continued to get worse and by about 9am we knew we weren’t going to make Milford Sound. As Milford is supposed to be one of the most beautiful parts of traveling through the South Island, I feel I need to provide a bit of information about it, even though I wasn’t able to get there this trip. Real Journeys provides a number of tours of the sound, including the Scenic Nature Tour that I had planned on doing. As my previous drivers tell it, just about everyone from the bus does some form of tour, be it kayaks or cruises. Since I didn’t really have any practical experience, I can’t give you any first hand information except to say that it seems to be a must-do along the tour and I’m gutted I missed out. 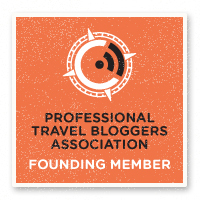 Check out the Real Journeys site for more info. With the roads the way they were, the decision was made to get to Invercargill a day earlier than we normally do. 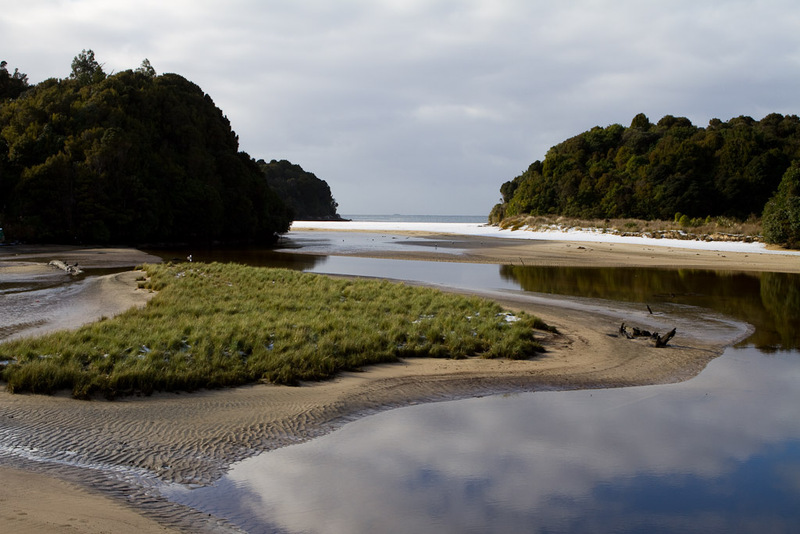 Invercargill is the gateway to Stewart Island, a nature reserve that is more accessible in the summer season but became more of an option because of our early arrival. We were all ready to catch the 5pm ferry until that too was canceled, this time due to high swells. With nothing to do in Invercargill (there really isn’t anything to do there), Chase, our driver, offered to set up a quiz night at Tuatara Lodge. We got into our groups for dinner, then met a few of the new faces over trivia and Celebrity, the game I taught at the Blue Duck Lodge. Early along our walk on Stewart Island. It's a strange thing seeing snow on the beach. The next day, half the bus caught the 8am ferry over to Stewart Island. After the hour-long ferry ride over some rough seas (bring those seasickness pills), we hopped off the boat and checked into our hotel. An hour or so later we split into a couple groups to wander the island. About seven of us took a four-hour walk out to Lee Bay and back. 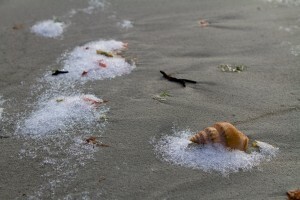 Highlights included snow on the beach, shell hunting, some more sub-tropical rainforest and a few private beaches. Stewart Island is mostly bush and you can do a 3- or 10-day trek around if you’ve the time. 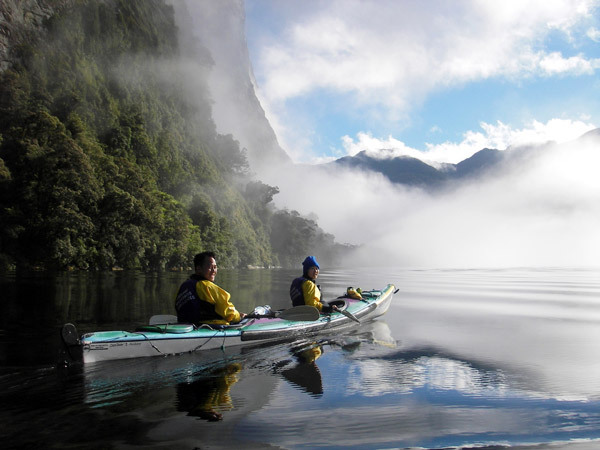 There are also a few activity providers for things like fishing and kiwi spotting if you’re so inclined. The shells one the beach at Horseshoe Bay, Stewart Island, were some of the most pristine I've ever seen on a beach. That night we were all exhausted. Most of the group had fish and chips on the recommendation of our driver and then crashed for the evening. We had to be up for another early morning to catch the ferry back to the mainland and at this point a bunch of us were fighting a chest cold now referred to as the Queenstown Plague. NOTE: SOME PICTURES OF MILFORD SOUND ABOVE WERE PROVIDED BY, AND USED WITH PERMISSION FROM REAL JOURNEYS.